KBS President and CEO Yang Sung-dong(right) welcomes Iraqi Ambassador Hayder Shiya Al-Barrak at KBS. 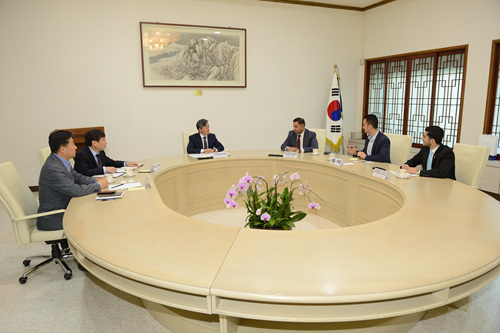 KBS executives meet with visitors from Embassy of Iraq in Seoul. KBS executives and representatives of Embassy of Iraq pose for a photograph at KBS. KBS welcomed a visit by His Excellency the Ambassador of the Republic of Iraq to South Korea Mr. Hayder Shiya Al-Barrak to KBS Headquarters on 1 June 2018. In a meeting with KBS President and CEO Yang Sung-dong, Mr. Al-Barrak expressed a keen interest in KBS and its roles as a primary public service media organization in Korea. The Iraqi head of diplomatic mission in Seoul said he would like to promote various aspects of Iraq through KBS channels as the the war against Islamic State(IS) in Iraq has ended. He stressed that Iraq has restored peace and stability and he is willing to play a role in establishing a formal working relationship between KBS and Al Iraqiya, the public broadcaster of Iraq. Mr. Yang said a KBS news production crew had visited Iraq in 2017 in co-operation with the Iraqi government and produced news content on the country. He added that he also hopes to see the two countries expand co-operation in the media field. As part of the visit to KBS, Ambassador Al-Barrak had an interview with the Arabic Language Service of KBS World Radio on issues such as the relationship between Korea and Iraq. KBS World Radio is an international radio network that airs in 11 different languages on short wave, medium wave and FM. Ambassador Hayder Shiya Al-Barrak began his duty in Seoul in April 2018.